It can be difficult to stay on track of a healthy diet during the holiday season, but giving up comfort foods doesn’t have to be part of the game plan. The key is knowing what ingredients to swap out and replace with healthier, yet still satisfying ones. I love replacing meat with tofu, but before you say you hate tofu, bear with me. The great thing about tofu - a low fat, protein-rich food that’s loaded with vitamins and minerals - is that it acts like a sponge and takes on the flavor of literally anything. It’s perfect in curry dishes like this Thai-style Coconut Curry with Noodles recipe from PastaFits. Red or green curry paste, along with garlic, fresh ginger, light coconut milk, soy sauce, lime juice, carrots, snow peas, and just a bit of brown sugar create a power punch of spicy, sweet, salty, sour flavor that infuses the tofu with tasty goodness. 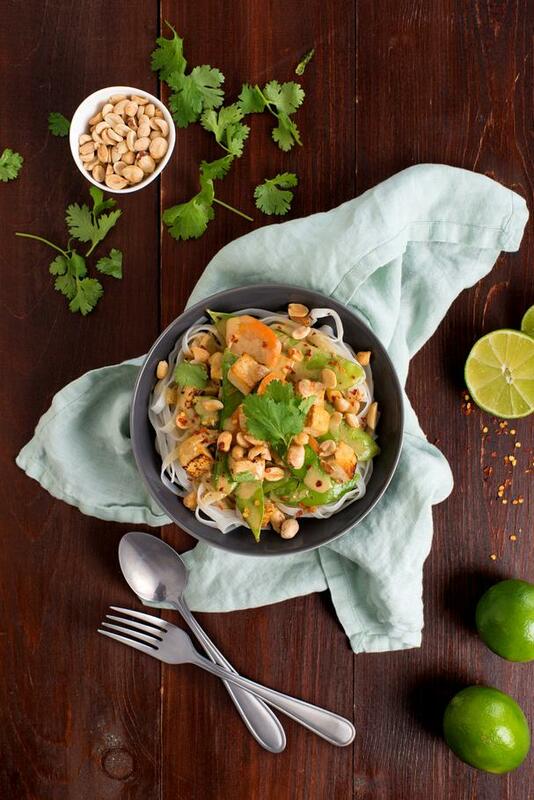 Pour the tofu vegetable curry sauce over rice noodles and garnish with toasted peanuts, fresh cilantro, and - if you like it spicy - some freshly chopped Thai chiles. It's a wonderfully delicious and healthy meal that will fill you up and keep your waistline happy! Cook rice noodles according to package directions. Drain. Meanwhile, heat oil in wok or large skillet set over medium-high heat; cook, tofu, onion, garlic and ginger, stirring often, for about 5 minutes or until tofu starts to brown. Stir in curry paste; cook, stirring, for 1 minute. Add coconut milk, soy sauce and sugar; bring to boil. Stir in snow peas and carrots; cook for about 2 minutes or until vegetables are tender-crisp. Stir in lime juice. Divide rice noodles among bowls; top with curry. Garnish with peanuts, cilantro, and chili flakes (if using).